Hi: it isn't even over, but I'm watching the Grammys. Actually lots of good stuff, and also stuff I can't connect with, so I wont say good or bad. What made the night for me however was that Lady Gaga (who I really respect as a musician) had a steel player!! We'll be ok guys. Anybody know who it was? Franklin D10 8&4, Excel D10 8&5, Moyo pedal, homemade buffer/overdrive, GT-001 effects, Carvin BX500 to BW1501 neo or TT-12 in closed cylinder, NV400, Rumble 40, and an graveyard of empty speaker cabinets in my garage. That would be the one and only....Tommy White. Hope there is some video of that. I actually like Lady Gaga. Who was playing steel with Dolly? Paul Franklin was playing for Dolly! Can't get any better those two! Mullen G2 SD-12 ,Mullen PRP S-12 BMI S-12, Stelling Top Tension, Zeta Violin, V8 octal, SGBB ,Profex2 Mosvalve 1500 , FP-100B, BJS Bars, LiveSteelStrings,Steelers Choice Seat. I don't waste my time on ANY award shows, ESPECIALLY the CMA awards. congrats to Tommy and Paul and anyone else who was keeping steel guitar in America's living rooms last night... bravo! I hope Lady Gaga was able to get Tommy's autograph. Are you sure that was paul? It didn’t seem to be to me, but it was hard to tell. Clearly, Lady Gaga keeps high standards and has the resources back them up and make her music the best she can make it. I agree... anybody notice that she had Paul McCartney's drummer? Yes, Abe Laboriel, Jr. Great drummer, son of great bassist Abe Sr. He looked like he was playing in slow motion. One of the guitarists was Mark Ronson, producer of Amy Winehouse’s great record. Yeah, that wasn't Paul. I didn't recognize him but it was a slender fella playing a single neck rosewood Emmons. On a side note, I wonder how Neil felt about them changing the lyrics to his song. Not me on the Grammy's....I was in LA that night playing the after show gig with Chris Stapleton at the Paladium. 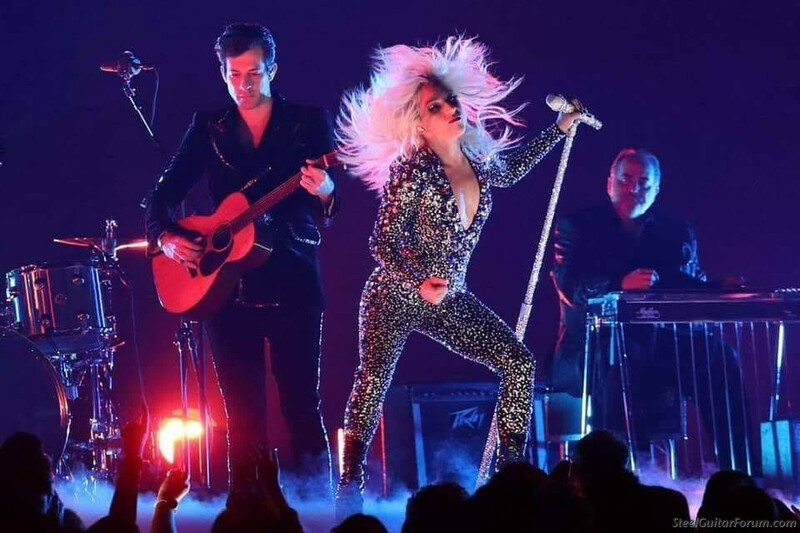 Tommy White was playing with Lady Gaga....I am so glad she found Tommy for her band...That is a world class gig with exceptional musicianship..Each player is a virtuoso.. Tommy's musicianship belongs on a stage with other musicians who can play at his level....An amazing gig for an extraordinary musician. Congratulations TW! Brett, back in the late '90s when Dolly-Emmylou-Linda recorded Trio II they changed some of the lyrics on After the Goldrush, for example, the part about "I felt like I could cry" as opposed to the original "I felt like getting high." I bought that CD when it was released. I did a little googling and it jogged my memory that Dolly did a solo version a few years prior to Trio II (which won a Grammy). According to Wikipedia she in fact received permission from Neil to change that line. I'm thinking Emmylou and Linda might have been cool with the original version, but the "high" part wouldn't go with the Dolly Parton image. Trio II went Gold with 500,000+ sold - so I'm guessing as the royalty checks started showing up in Neil Young's mailbox he was perfectly fine with it. And I thought the version on the Grammys with Maren Morris and Miley Cyrus accompanying Dolly was outstanding. So i'll consider that a victory for musicianship. I don't waste my time on reading long "brag lists" of all the equipment I own. ho cares? Huh. I don't waste my time on reading long "brag lists" of all the equipment I own. Who cares? Huh. Hey Mike, I did not watch but curious to know who these three are in the picture? Thanks, J.R.